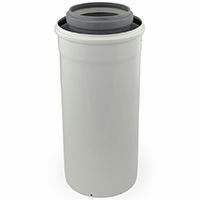 Centrotherm Innoflue polypropylene Single Wall (SW), Flex and Concentric vent pipe, fittings and accessories for residential & commercial natural gas and propane-fired boilers, water heaters and furnaces. UL 1738 listed and approved for Category IV (power vented, condensing) appliances. Innoflue Single Wall (SW) rigid venting pipes, elbows, appliance adapters, and accessories for direct vent and indirect vent equipment. Innoflue Concentric (2-in-1 flue exhaust and air intake) pipe, elbows and accessories for direct vent type appliances. Innoflue Flex (flexible) polypropylene piping, parts and accessories for B-vent and chimney vented heating appliances. Why use PolyPropylene (PP) vent pipe? With arrival of high-efficiency condensing technology, metal flue vent pipe faced the difficulties of handling highly corrosive condensate produced by appliances. Since traditional piping proved to be unusable, newer and more expensive steel alloys had to be developed to withstand harsh conditions. Since flue gas temperature in condensing appliance is lower than in non-condensing, some companies opted for using PVC or CPVC pipe as a cost-effective alternative. These too, however, soon proved to be unsafe and unusable. Due to high risk of cracking and leaching poisonous flue gases, many local codes prohibit installers from using PVC, PVC and/or ABS in flue venting applications. 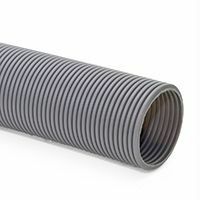 Polypropylene (PP) flue vent pipe became the solution which incorporated lower material costs with durability and high temperature resistance, and is now approved and widely accepted for use in the U.S.
As of today, Innoflue pipe manufactured by Centrotherm is the only UL 1738 listed (not simply compliant) polypropylene vent pipe on the market. 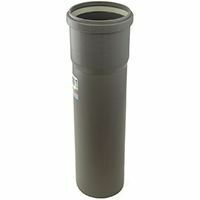 It is also the only pipe approved by over 50 U.S. manufacturers of boilers, water heaters and furnaces.